The Indian Valley Fire burns in Rio Blanco County Friday afternoon. Two fires were burning along the Rio Blanco and Moffat County lines Sunday afternoon. Lightning sparked the Indian Valley fire that was reported on Friday and sent ash north into Craig. Crews started responding to another fire about 3:30 p.m. Sunday between Sulphur Creek and Wilson Creek in Rio Blanco County resulting in smoke that was reported in Meeker. Not much was known about the second fire. “We have crews on scene and aircraft flying it as well,” reported the Rio Blanco Sherriff’s Office on their Facebook page. Meeker’s Herald Times reported that the second fire had burned 15 acres and growing. 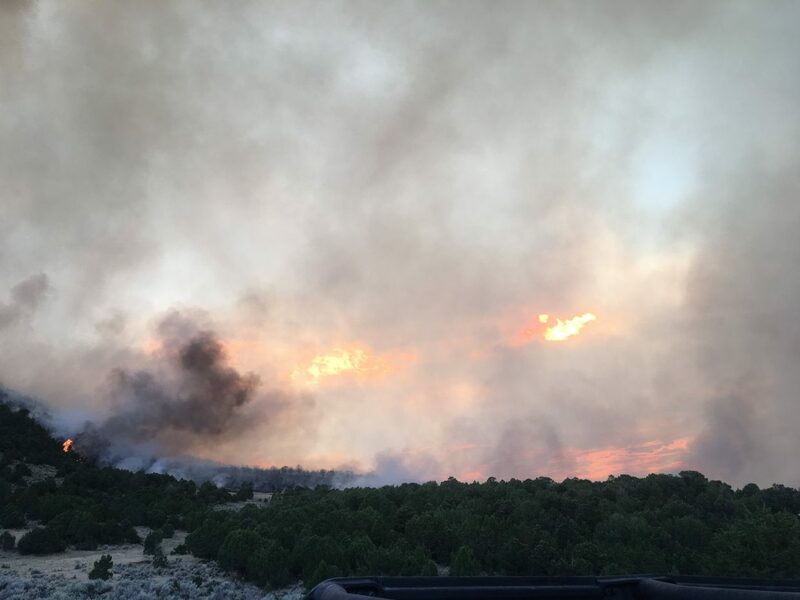 According to the same source, the Indian Valley Fire had also grown to 5,100 acres as of 5 p.m. Sunday, threatened at least four structures and sage grouse habitat. The Indian Valley Fire was only five percent contained burning on private and public land managed by the Bureau of Land Management prompting a Type 2 incident team to be called up to help fight the fire. A total of 89 wildfires have been recorded this year by the Craig Interagency Dispatch Center. Most were small and quickly suppressed. The Craig Press will continue to update on the recent fires as more information becomes available.